Herbert Salter was born Herbert Ernest Donovan in 1892 in Naracoorte, South Australia to Henry John Donovan and Elizabeth Ann Balsar. The Naracoorte Herald, of 10 September 1897, reported on a fire at the home of “the Donovan family”. The town rallied around the large family. This was presumably the home of Henry and Elizabeth Donovan. Henry disappeared around that point but Elizabeth was still in Naracoorte in 1899 when charged for not sending one of her children to school. In 1905, an Elizabeth Ann Salter appeared on the Victorian Electoral Roll, living at Victoria Valley with a John Peter Salter. In 1907, Elizabeth married John Peter Salter and they had a daughter in the same year. By then they were living at nearby Dunkeld and Herbert was fifteen. While at Dunkeld, Herbert completed a two year carpentry apprenticeship with his step-father. In 1914, Herbert was listed on the Victorian Electoral Roll as living at Mt Baimbridge Road, Hamilton and working as a labourer. 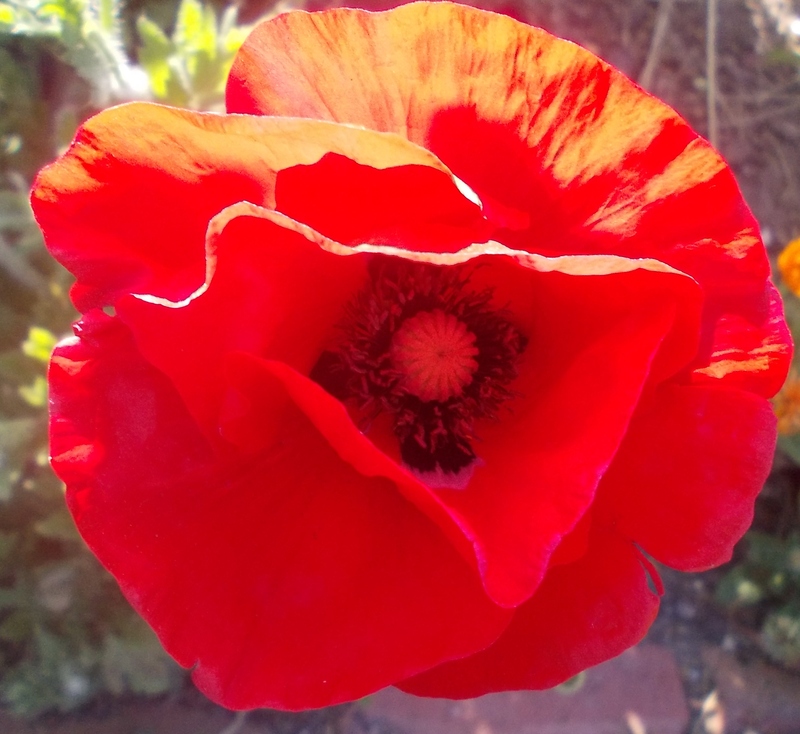 His brother Thomas John Salter, born in Wentworth NSW in 1889, lived on Digby Road. Herbert enlisted at Hamilton on 29 January 1916 and then was working as a farm labourer. Herbert left Australia with the 8th Battalion, 16th Reinforcement but transferred to the Cyclists Training Battalion on 28 May 1916 after his arrival in Egypt. Within two weeks he was sailing for England. Herbert was AWOL from 14 August 1916 to 17 August 1916 and when located, it was found he had an altered leave pass. Herbert then transferred to 7th Battalion on 15 September 1916 and proceeded to Belgium arriving at the 7th Battalion camp near Brandhoek on 29 September 1916. The unit diary reported the arrival of many new reinforcements on the evening on 29 September 1916. On 29 June 1917, Herbert was promoted to Lance Corporal. At the time, the 7th Battalion were camped at Henencourt Wood, Belgium. The following month, Herbert wrote a will leaving everything to his brother Thomas. The 7th Battalion fought in the battle of Menin Road on 20 September, 1917. On 1 October, while at Steenvoorde, France, the battalion were given orders to move to Westhoek Ridge near Ypres to prepare to move out to Broodseinde for a proposed battle on 4 October. On the evening of 3 October, they moved into position in dangerous conditions. Once in the trenches there was heavy shelling but the allies managed to reach their objective. It would seem that Herbert made it through the day of the 4 October. It was later reported that on 5 October while near Passchendaele Wood, Herbert and another soldier were carrying smoke flares to the company HQ at the end of a trench. A sniper’s bullet hit Herbert in the heart killing him instantly and was buried nearby that evening. Reported as missing, an investigation was held into Herbert’s disappearance. A witness statement from Stawell’s Lieutenant (Lt) John Ross of the 7th Battalion said that if Herbert had been spared, he would have risen to a higher rank. While still a Corporal, Lt. Ross was with Hebert on 5 October 1917 and buried him. Lt Ross was himself killed on 9 August 1918. “Advertising.” Hamilton Spectator (Vic. : 1870 – 1873; 1914 – 1918) 8 Dec 1917: 6.<http://nla.gov.au/nla.news-article119860260&gt;. 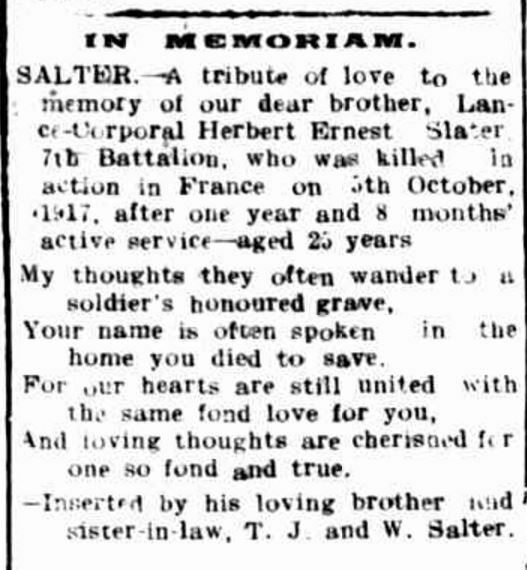 Herbert’s step-father John Peter Salter, died in late January 1918 at Thomas Salter’s house in Digby Road. Herbert’s mother Elizabeth Salter moved to South Yarra and was from their she wrote a letter to Base Records on 25 February 1918. She advised them of John’s death and that she was now Herbert’s next of kin. Elizabeth also told how she had been away when Herbert enlisted and didn’t know until months after. Herbert enlisted in 1916 and the Victorian Marriage Index shows Elizabeth married Victor Samuel Ashley in the same year, two years before John Salter’s death. She signed her letter as Elizabeth Salter but signed later letters as Elizabeth Ashley. Elizabeth died in Melbourne in 1949.